Are you celebrating Galentine’s Day this year? A great way for women to have fun on Valentine’s Day, the once-fictional holiday is now a special day that many women celebrate with the special “gals” in their life. Galentine’s Day came to life on the TV show Parks and Rec, when character Leslie Knope, played by Amy Poehler, declared the annual holiday, inspiring women everywhere to do the same. Women have Galentine’s Day parties and organized events and some have intimate gatherings at their home, where women drink, watch movies, play games and exchange gifts. Galentine’s Day usually takes place the day before Valentine’s Day, on Feb. 13, but the best thing about this day is that you can celebrate it any time during February. It’s about celebrating love, period. Whether it’s a suspense/thriller like Serenity or a comedy like What Men Want, to an action movie with a female lead like Miss Bala, there’s some great movie options out now to gather up your girls and have some fun. 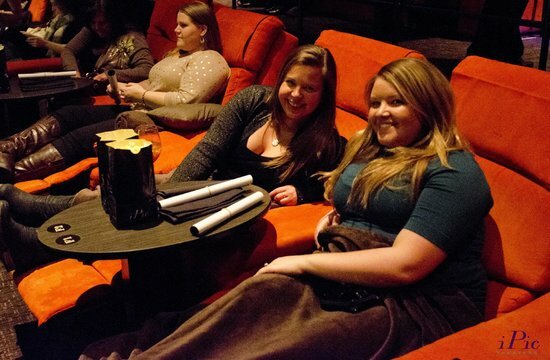 With many theaters now offering table service and comfy seating with tables such iPic, seeing a movie is now more of an experience and perfect for a Galentine’s Day night out. If you “Google” DIY Galentine’s Day ideas, you will be bombarded with the most amazing ideas on how to host an incredible night at home with your girls. From creating your own DIY Heart Photo Backdrop to take pics in front of, to creating small gifts to give out such as mini flower bouquets and personalized thank you cards, you can truly create a vibe on your own by letting your creative side shine. We’re loving the DIY decorative ideas we’re seeing online such as creating a heart wall by simply taping heart shaped plastic/paper plates to the wall (see above) and creating a Galentine’s Day banner. The possibilities are endless! Brunch is always a good idea. That sums it up in a nutshell. Mimosas for life! Check out Groupon for some brunch deals or check your local restaurants to see if they are doing any specials for Galentine’s Day. Always check Yelp for reviews and discounts as well! Karaoke is always fun and the perfect excuse to get all your girls together and channel your inner Mariah Carey or Ariana Grande. You can easily do karaoke at home but it’s more fun to rent a room at a karaoke place, order some cocktails and snacks, and grab a mic! Check Groupon for some deals at local karaoke spots. Everyone can use a spa day (us included) and it can be a great way to connect with your girls, have some drinks and chill out. At the spa, you can treat yourself to a facial, mani/pedi and a hot stone massage. End your spa day with some desserts in a fun place where you and your crew can take Insta-worthy pictures. However you celebrate Galentine’s Day this year, just remember to have fun with your girls and enjoy the moments! Previous ArticleYour PLUS Model News Recap!